Lotus tenuis Waldst et Kit. ex Willd. Species: Lotus tenuis Waldst et Kit. ex Willd. 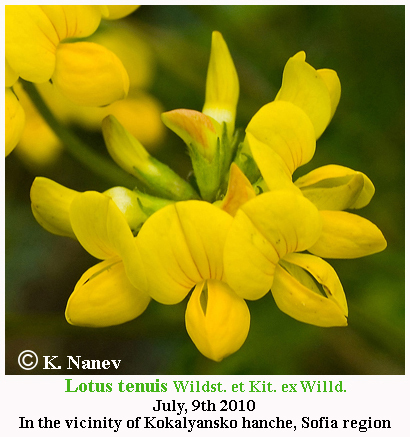 English Name: Narrowleaf trefoil, Narrow-leaved bird's-foot-trefoil, Slender trefoil, Creeping trefoil, or Prostrate trefoil. Perennial plant. Stem widespread, ascending or upright, 20.0 - 40.0 (90.0) cm from the base branched, round, thick, bare, or scattered fiber. Leaves imparipinnate; the axis 2.0 - 4.0 (8.0) mm long. Leaflets 5, 5.0 - 15.0 (17.0) mm long and (1.0) 2.0 - 3.0 (5.0) mm wide, linear to linear lance or lance back, upper leaves at least (3) 4 times longer than wide; basically drained wedge narrowed, the top prolonged pointed, entire, green, bare or short-fitting fiber. Stipule small, stellated or undeveloped. Floral branches 4.0 - 6.0 (11.0) cm long, naked, longer than the axillary leaves. Flowers 2 - 4 (6) in clusters of head or single in the bosom of the leaves. Flower stems 2.0 mm long, naked. Calyx 4.0 - 5.0 mm long and 2.0 - 3.0 mm wide, pipe-like bell-shaped, goals or absently short fiber, regular; triangular teeth styliform, more or less, equal or only two shorter, inside densely fitting short fibrous, usually shorter or equal to the tube. Corolla (6.0) 10.0 - 11.0 (12.0) mm long. Flag 7.0 - 8.0 mm wide, broadly elliptical to circular, the top entire, to middle or lower third gradually narrowed in wide long fingernail, longer than the wings and keel, yellow, naked. Elliptical wings back ovate, basically a large elliptical appendage, narrowed into short thin nails, more or less equal to the keel, yellow, naked. Ovoid elliptical keel, the top prolonged peaked strongly curved sickle, basically thin nails, yellow, naked. Beans 1.5 - 3.0 cm long and 2.0 - 2.5 (3.0) mm wide, cylindrical linear, circular cross section, the top short-pointed, not Pinch, goal with many seeds. The seeds 1.5 mm long, lenticular, dark brown, smooth. Note. A number of authors, including most Bulgarian (Stoyanov and Stefanov, 1925; Stoyanov, Stefanov and Kitanov, 1967), L. tenuis considered as intraspecific taxon of L. corniculatus. Systematic studies of its kind (kariologichni, hemotaksonomichni and others. - Harney & Grant, 1965; Grant & Sidhu, 1967) indicate that probably L. tenuis (diploid) is one of the output species alotetraploida (not autotetraploida) L. corniculatus. 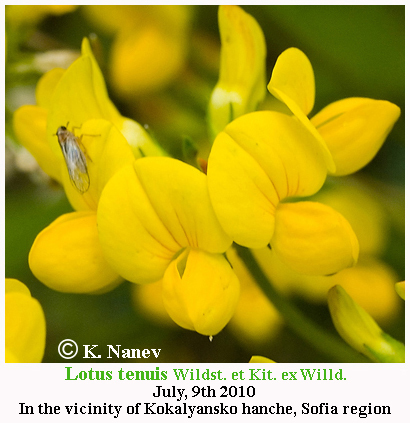 Lotus tenuis is a flowering plant of the pea family Fabaceae, native to western and southern Europe and southwest Asia. 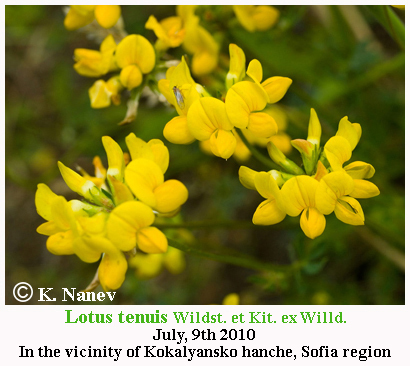 Some botanists treat it as a subspecies of Lotus corniculatus, as L. corniculatus subsp. tenuifolius. Its tolerance of salt and poor soil make this plant useful for marginal conditions. It has become naturalised in many other locations, including the Pampas of Argentina, and parts of the United States. Common names include narrowleaf trefoil, narrow-leaved bird's-foot-trefoil, slender trefoil, creeping trefoil, or prostrate trefoil. Flowering Time: Blooms: V - VII, fruitful: VII - VIII. Distribution in Bulgaria: Grow in the dry grassy and stony places around pastures and thickets, often in fields such as weed in the plains and foothills. Spread from sea level up to about 1000 m altitude. (Conspectus of the Bulgarian Vascular Flora) = conspectus&gs_l= Zlc. Distribution: Europe, the Caucasus, Central Asia, Mediterranean.